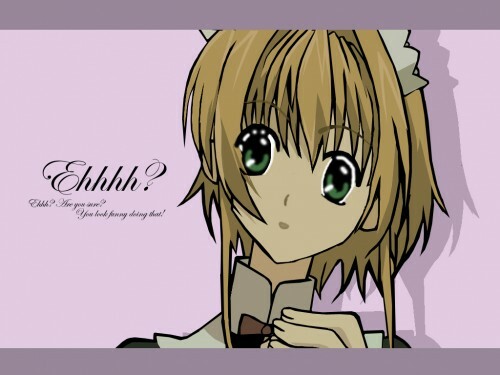 Tsubasa Reservoir Chronicle Wallpaper: Ehhhh? Are you sure? Minitokyo »	Tsubasa Reservoir Chronicle Wallpapers » Tsubasa Reservoir Chronicle Wallpaper: Ehhhh? Are you sure? Haha xD Haven't sumbitted an artwork for 6 months now..Omg..that's like hald a year.. haha XD Time flies so fast! If i wasn't aware of the date, I would have thought its Febuary! I wish to dedicate this wall to cassandraronald, amethystsnow, gallopia, midsummer, kyuumew & norine07! There's even a song that goes along with this wall! Sometimes i'm lonely, Sometimes i'm depressed but i always know someone is wanting and loving me oh so much. I hug my self with my eyes shut dreaming. My life is like a story book. cause there are always sunshine days in life. but sometimes we just have to strive on with our own effort. It ain't easy but its not that difficult. We just need some hardwork to smile. The vctor is not fine to me ^^"
Demo Kept practicing it! ma Ganbate desu~! but... i guess you used the lasso tool right? my opinion is to use the pen tool and fill method! and the background... should make it blend well with sakura! here's the fav to cheer you on! Cute. I like the reference from the anime.